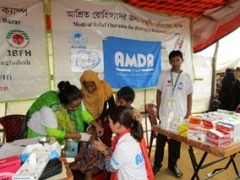 From 14-15 November 2017, a coordinator/nurse from AMDA Headquarters visited AMDA’s temporary clinic (AMDA Medical Camp) set at Kutupalong refugee camp in Cox’s Bazar where AMDA has jointly launched a year-long relief project with AMDA Bangladesh and Japan Bangladesh Friendship Hospital (JBFH). The influx of Rohingya refugees which started in 1991 had already reached to the point where its population had increased to about 200,000 within Bangladesh. However, the current crisis exacerbated the situation as the Bangladeshi government called on earlier generations of the Rohingyas (who had already been dwelling in different parts of the country for sometime) to return to where they were supposed to be. This naturally led the camp to become excessively overcrowded, so much so that it made it hard to grasp the precise number of the whole asylum seekers. Instead, the so-called “camp leaders” have been maintaining the daily affairs in the field. At the time of AMDA’s visit, there were already 1,012 people fulfilling this role. Mainly comprising educated youths, their job is to provide aid-related information and allocate work to the camp dwellers whenever a work opportunity arises. Bearing in mind that each leader handles 100 to 200 families on a daily basis, it makes it a reasonable presumption that approximately one million people have been seeking refuge at the camp. On top of this dire situation, as of now, arriving refugees sometimes reaches 5,000 per day. The view of the camp was appalling with self-made tents jumbled up in the entire area. The tents are made with bamboo and plastic sheets but such “building materials” are not enough to catch up with the increasing population. Some shops in the camp have solar panels for securing electricity but this is certainly not the case with the makeshift tents. As the camp is set on the heath, the paths are unpaved and are difficult to walk. According to the camp dwellers, the relief goods such as rice, peas, and oil were supposed to be delivered once a week. However, the aid assistance hasn’t panned out as it was hoped. As a result, there is always a line of people queueing up for relief supplies, with people always carrying things from one place to the other. Although toilets were initially set by the authority, they are not maintained well enough as human waste are left untreated while the stench is filling the air. There is only one toilet for 200 people and one bore-well for 400. (The government is currently constructing the latter in response to the desperate need.) 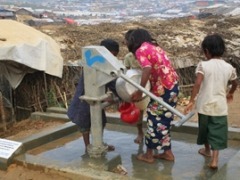 The water supply also comes from aid trucks that bring water in tanks. Likewise, people sometimes get water in a big plastic bottle. The living space is also limited with the view of laundry at every tent. It is especially troublesome for women as they have no place to bathe. Although they try to come up different ways of bathing (e.g. by bathing in the shade of a house or set up a temporary hut), nothing has been really done to counter this problem. The refugees have been forced to spend their day idly as there is not much to do other than lining up for relief supplies. While kitchen utensils are gradually being furnished, cook stoves and firewood are not enough. There are shops and a market around the central part of the camp where people can buy vegetables, water, juice, fish, peas, snacks, bread, as well as firewood and oil. However, the shop owners say their income is meager as transportation of goods costs a lot of money, thereby making it difficult to make a profit out of their business. When they are asked what their biggest problem is, they say it is the joblessness in which they cannot make any cash earnings while their food is secured to a certain degree thanks to various assistance. For those who received school education, they often find a job at aid organizations to work as an interpreter or a clerk, whereas, for those who never went school, they tend to engage themselves in construction work such as paving roads or building houses. At any rate, the “job-market” here is getting tough. 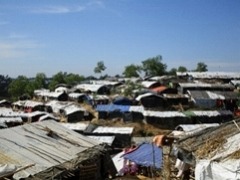 Schools for children are lacking in the camp but this shed another light on the plight of the Rohingyas. As many of them were neither entitled to proper education in Myanmar other than religious schools, not going to school in the camp didn’t seem to make much difference to them. Children are genius at creating something fun out of limited resources. They make kites using plastic bags or cars out of plastic bottles. The only concern seems adults often send them to line up in a queue for relatively small items as long as they are manageable for them to carry. This has put a certain burden on children.